• For quantitative determination of phosphatase activity. • High sensitivity and wide linear range. The detection limit is generally 3 ng phosphatase or below. • Homogeneous and simple procedure. No wash or reagent transfer steps are involved. The assay can be completed within 30 minutes. • p-nitrophenyl phosphate (pNPP) is a chromogenic substrate for most phosphatases such as alkaline phosphatases, acid phosphatases, protein tyrosine phosphatases and serine/threonine phosphatases. The reaction yields para-nitrophenol, which becomes an intense yellow soluble product under alkaline conditions and can be conveniently measured at 405 nm on a spectrophotometer. This homogeneous "mix-and-measure" assay involves simply adding a single reagent to the phosphatase and measuring the product formation on an absorbance reader. The assay can be conveniently performed in cuvettes, tubes or multi-well plates at either room temperature or 37?C. The Sigma enzyme should work with our assay kit. 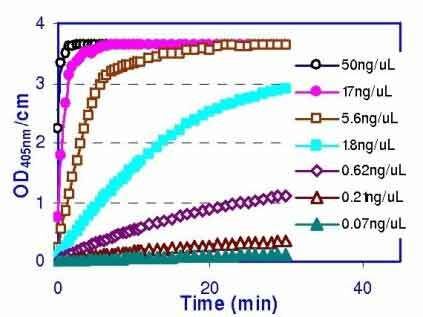 As indicated in our assay protocol, the customer needs to prepare their own enzyme buffer (100 mM Tris-HCl (pH 8.6), 10 mM MgCl2 or similar buffers) to raise the pH to 8.6 for an alkaline phosphatase. 2. Does your pNPP kit measure the units of activity or does it measure the moles of pNPP liberated/ minute? Out kit measures the moles of pNPP liberated per minute as a unit for enzyme activity. 1. Huxtable AG et al (2009). Tripartite purinergic modulation of central respiratory networks during perinatal development: the influence of ATP, ectonucleotidases, and ATP metabolites. J Neurosci. 29(47):14713-25. Assay: Phosphatase in Human cells (Pubmed). 2. Lee SW et al (2008). The Xanthomonas oryzae pv. oryzae PhoPQ two-component system is required for AvrXA21 activity, hrpG expression, and virulence. J Bacteriol. 190(6):2183-97. Assay: Phosphatase in Human mesenchymal stem cells (Pubmed). 3. Oborna I et al (2010). Increased lipid peroxidation and abnormal fatty acid profiles in seminal and blood plasma of normozoospermic males from infertile couples. Hum Reprod. 25(2):308-16. Assay: Phosphatase in Fish marine teleost follicles, eggs (Pubmed). 4. L?pez-Vales R et al (2010). Fenretinide promotes functional recovery and tissue protection after spinal cord contusion injury in mice. J Neurosci. 30(9):3220-6. Assay: Phosphatase in Mouse cell supernatant (Pubmed). 5. Monick, MM et al (2006). Active ERK Contributes to Protein Translation by Preventing JNK-Dependent Inhibition of Protein Phosphatase. J. Immunol. 177: 1636?1645. . Assay: Phosphatase in Bacteria cells (Pubmed). 6. Sawaguchi S et al (2006). Identification of two forms of vitellogenin-derived phosvitin and elucidation of their fate and roles during oocyte maturation in the barfin flounder, Verasper moseri. Zoolog Sci. 23(11):1021-9. Assay: Phosphatase in Zebrafish serum (Pubmed). 7. Nakano Y (2007). Novel function of DUSP14/MKP6 (dual specific phosphatase 14) as a nonspecific regulatory molecule for delayed-type hypersensitivity. British J. Dermatology 156 (5): 848?860. Assay: Phosphatase in Chicken intestinal tissue (Pubmed). 8. Villa-Bellosta, R et al. (2016). Alternatively activated macrophages exhibit an anticalcifying activity dependent on extracellular ATP/pyrophosphate metabolism. American Journal of Physiology-Cell Physiology. 310(10): C788-C799. Assay: Mice. (Pubmed). 9. Villa-Bellosta, R et al. (2013). Defective extracellular pyrophosphate metabolism promotes vascular calcification in a mouse model of Hutchinson-Gilford progeria syndrome that is ameliorated on pyrophosphate treatment. Circulation, 127(24):2442-2451. Assay: Cells in Mice. (Pubmed).